When you taste this Greek-spiced meat, you may throw your hands in the air and yell, “Wow!” When you taste the herbal Spearmint Cream Sauce that gets poured over the top, you may not believe the amazing flavor explosion that went off in your mouth. I am completely serious, because this is what happened to me. 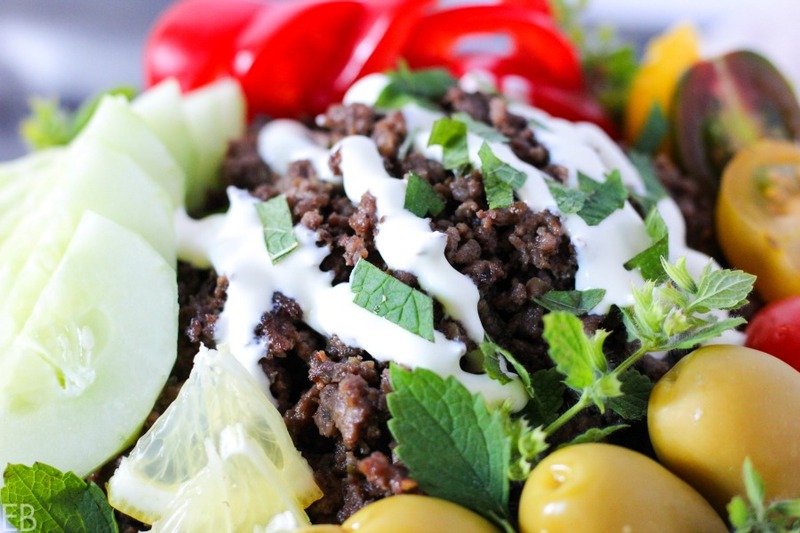 15-minute KETO Greek Bowls use either beef or lamb, whichever you prefer. And Greek Bowls are delicious for Keto, Primal (Paleo + dairy), GAPS and low-carb eaters. Are bowls a part of your regular dinner rotation yet? If not, I recommend them for two reasons: One, they’re quick for the cook to assemble. Two, eaters love bowls. For the cook, bowls simply entail the chopping of a few veggies, maybe the purchase of a certain condiment (like salsa or yogurt, or using homemade), and the easy prep of some meat. Underneath these toppings, the cook provides an almost-no-work base of usually cauliflower rice (prepackaged frozen works great), which can be cooked quickly (5 minute simmer) in salted water or roasted in a casserole pan in the oven with some bacon fat or butter and sea salt (400 degrees for 15-20 minutes). So the components are super easy. The only decisions are: how to spice the meat, and what toppings will make the meal special. Eaters love bowls because they are delicious comfort food — soft textures, packed with flavors, and can be eaten with either fork or spoon. Eaters also love bowls because they’re casual — they put one at ease, and they can be made by each individual, to suit each person’s preferences. 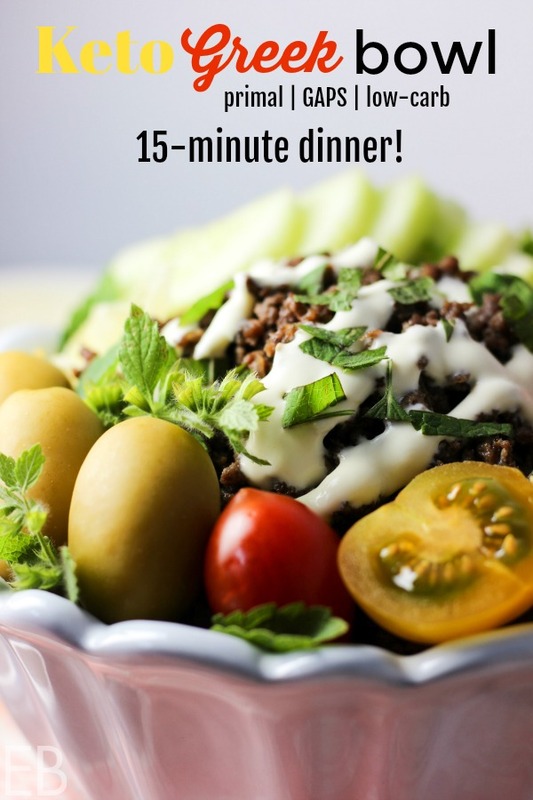 Here’s another bowl I know you’ll love: 15-minute Keto Asian Beef Bowl (also Paleo, GAPS, Low-carb and Whole30). 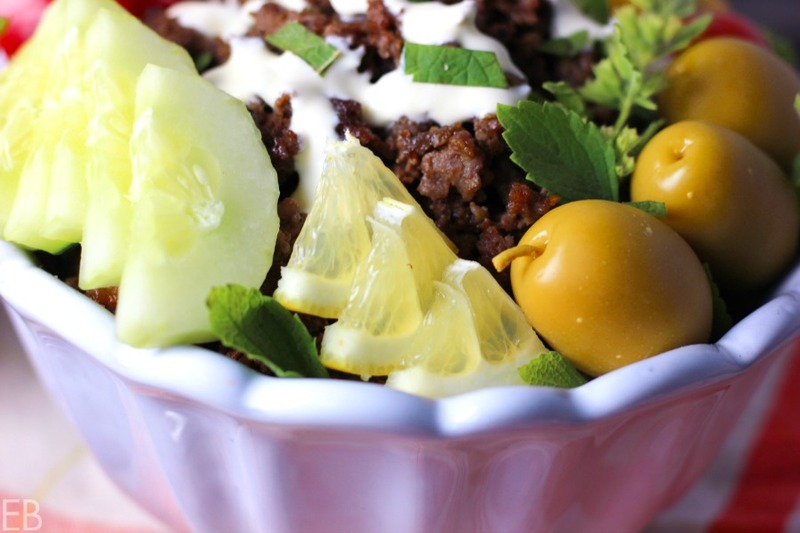 Greek Bowls are made special with a beautifully spiced meat! Use either ground beef or ground lamb, whichever you prefer. The meat is cooked and even finished with a bit of butter! Butter creates a creamy sauce with lemon and oregano. The whole bowl gets topped with a creamy-exciting spearmint cream sauce that you’ll LOVE. Add to this summer’s tomatoes, your favorite olives, garden cucumbers, fresh mint and more. I love that bowls combine the best of fresh … with warm, rich umami flavors! I love that this Keto, Primal, GAPS bowl tops all with something creamy, herbaceous and invigorating! And at dinner, especially, I love getting to enjoy so much summer produce! This bowl makes me feel healthy and happy. See if you don’t say, “Wow!” too, when you take that first bite of spiced meat and creamy spearmint cream! This dish is beautifully high in fat and low in carbs. I LOVE the saturated meat fat in this recipe, combined with great Kerrygold butter. I love the cream sauce. 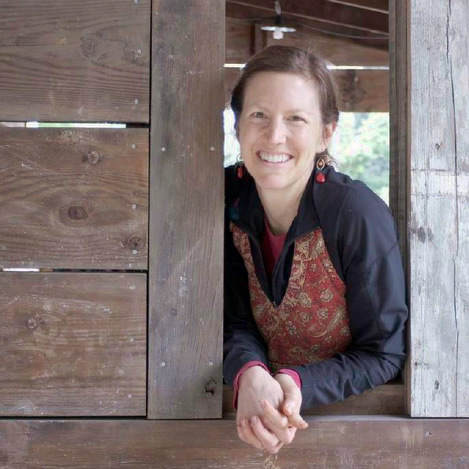 Enjoy these rich foods that leave you feeling energized! Well-sourced fats help your body to fuel itself efficiently! Learn more about how and why the Keto diet provides energy to the body here. Combine all ingredients in small bowl. Whisk thoroughly to combine, until smooth. Set aside. Heat medium size skillet over high heat. Add 1 tablespoon butter. When melted, add ground beef or lamb, sea salt, dried oregano and onion powder. Cook over high heat 5 minutes, breaking up meat into small pieces with your spatula the whole time. When meat is mostly cooked, turn off heat, but leave pan on burner. Move meat to outer edges so the middle of the pan is empty. Add the remaining 2 Tablespoons butter. While it melts, add, on top of it, the one drop lemon or lemongrass essential oil (or lemon rind) and 5 grinds of pepper. Stir the butter into the meat. Fill each bowl with hot cauliflower rice, or have guests/family each make their own. 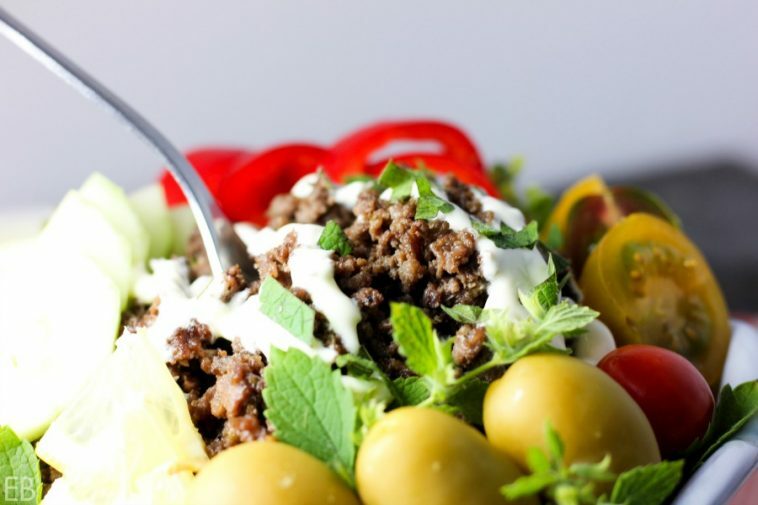 Top rice with meat, cucumbers, tomatoes, red bell pepper, thin lemon triangles or larger wedges for squeezing, olives, spearmint cream sauce and fresh mint. Garnish with oregano. Here's the right size cast iron skillet, if you don't already have one! Here's how to clean it when it arrives. Do you enjoy Greek ingredients and flavors (as much as I do!)? I’ve got the ingredients for this on my next grocery list! That dressing/sauce is making my mouth water reading the ingredients! I can’t wait to try it! having gyro salads tonight, going to try your addition of lemon to the meat, yum! Do I have 15 minutes? Yes. Am I in the mood for these flavors? Yes, always!! Haha, love it!! 😉 Yay, hope you enjoy! This looks amazing! On the menu for tomorrow! My hubby loves Greek food! I know this would be a hit with him! Great, Raia!! Me too, Greek flavors and ingredients are exciting!! Makes for a fun dinner! Thanks for commenting. I hope you guys love the meal. Love this recipe and it’s yummy flavors. I can’t wait to try it out one night this week. I am obsessed with anything I can use cauliflower rice in! This sounds delicious! This is so tasty!! I love trying new keto friendly dishes. Those greek flavors are my favorite! That spearmint cream sauce!!! Oh my goodness Megan that is just brilliant!!! 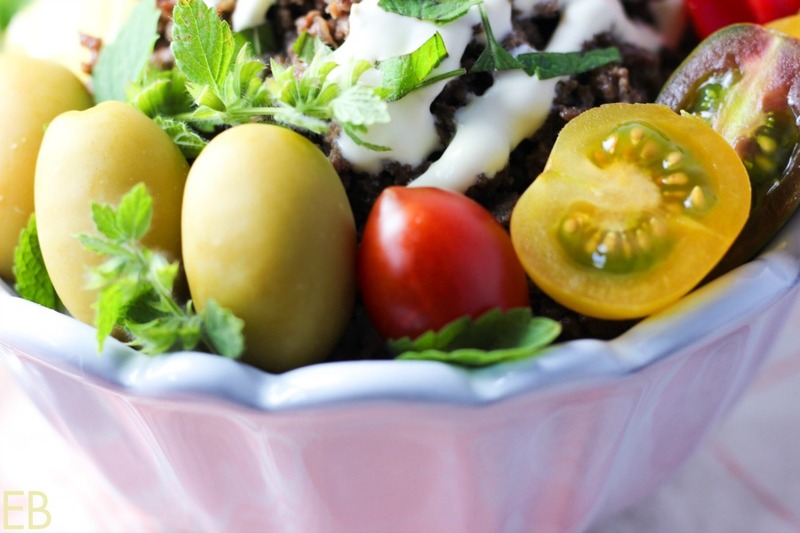 This is such a lovely meal with so many textures and flavors, the herbs – swoon, and those plump olives – so yummy! Oh man what a great combination of flavors ! And I love Greek touch in it! Thanks, Tatiana! I love the Greek flavors so much! 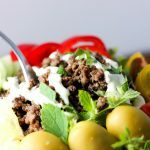 I love greek flavours and I really love low carb, high fat dinners – win win for me on this recipe! LOVE Greek flavours and you have captured them all here.. I’ve made minty yogurt sauces before but the addition of the chevre takes to a new level! Opa!! I love this bowl recipes! Keep sharing recipes like this! Thanks!